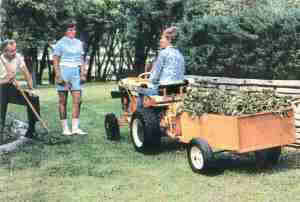 Fail cleanup is especially fast and easy w it it the heavy-gauge, reinforced steel, half-ton dump cart. Dump body dumps completely vvithout disconnecting trader hitch or lifting trailer wheels from ground. Allis-Chalmers vacuum collector creates a powerful vacuum force that cleans up leaves, clippings and other debris in one fast trip -- as you mow. 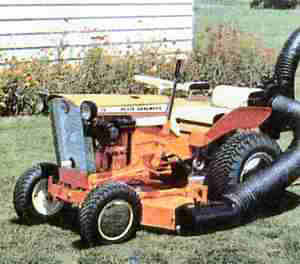 Big: flexible vacuum hose attaches to rotary mower and deposits material into canvas-topped cart. Holds about half an acre of clippings, or 26 bushels. 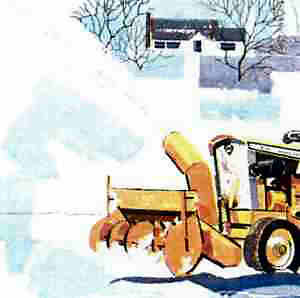 Angle-type snowplow and dozer blade mounts up front . . . cleans drives fast. 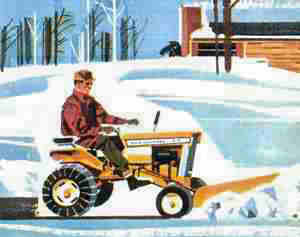 Big 42" width makes it excellent for grading and cleaning work, too, especially farm buildings and poultry runs. Powerful, 36" rotary snow thrower penetrates the deepest snow banks, keeps going on uneven ground . 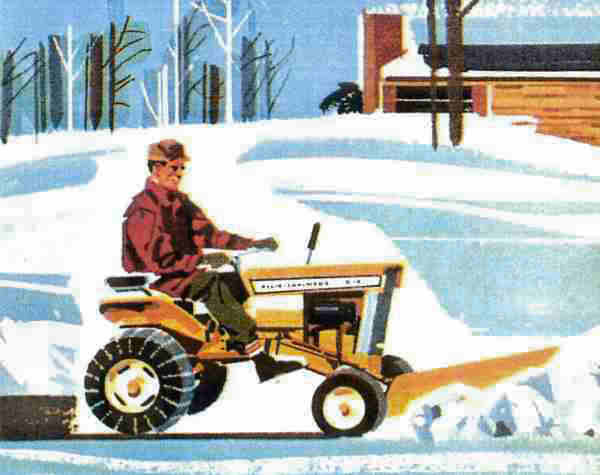 . . And B-10 power sees that you don't have to move the snow twice to clean a wide drive. Powerful throwing action piles your snow on the far side of the drive, or just where you want it. Revolving outlet duct adjusts to throw snow in any direction.